Have you ever wanted to start a B2B business only to become intimidated by the idea? Perhaps you’ve even been sweeping the notion under the rug for several years? If so, you’re certainly not alone. Countless businesses never start because of fear of failure and lack of drive. But what if your B2B idea is stellar? What if the world would benefit from your vision if only you could get it off the ground? If you’re torn between abandoning your idea and giving it a shot, this article will hopefully help you decide what to do. Here are five important factors to consider before starting your B2B business. It’s no secret that launching a startup is hard. So hard, in fact, that most people aren’t cut out for it. Challenging times call for mental fortitude. Simply put, you probably won’t succeed without an abundance of at least three characteristics: conviction, grit, and passion. It’s crucial that you believe in your product with every fiber of your being – right down to your DNA. When someone tells you your product is no good or will “never work,” you’ll need the ability to shrug it off. If you don’t have such convictions, your chances of succeeding are small. Grit – the ability to persevere throughout the strongest of storms – is another absolute necessity. You’ll need to be distinctively resilient and unusually hardworking if your business is going to become a success story one day. There are certainly many other beneficial mental traits that successful entrepreneurs possess. And perhaps you have many of them! But the three I mentioned above are ones I feel are especially important for B2B startup success. Starting a business is a journey that few are brave enough to embark on. If you’re one of those few, you’ll need to continually strive to reach higher levels of knowledge. Otherwise, you’ll risk giving your competitors room to outsmart you. You know the centuries-old “knowledge is power” cliché? Well, you’ll want to heed that sentiment. It has survived the ages for a reason: because it’s true. There’s a misconception that “personal” should be left to B2C businesses, while B2B should be “strictly business.” If you’re more comfortable with B2B primarily because you feel you’re not personable enough for B2C, you’ll want to re-think your reasoning. The reality is that you need to be resolved to get personal. No matter the industry, people want to do business with people rather than impersonal corporations. The tendency to avoid a personal touch in B2B may stem from a fear of appearing unprofessional or amateurish. Also, entrepreneurs know that B2B is predominately account based. Decision makers often buy for a whole company, unlike a consumer who buys for herself or her family. But none of this negates the need for personalization. To really be at the top of your competitive game, give your business a “personality” that clients can enjoy and relate to. How? If your industry is complex and full of confusing jargon, find ways to associate a warmer personality to your products. Simplify complexities. Communicate in laymen’s terms. Develop a reputation of a helpful friend who empathizes with the challenges decision-makers face. Trust is a crucial extension of personalization. Without the ability to earn the trust of your new clients, your B2B venture probably won’t survive its first year. Trust is often the primary factor in a B2B client’s decision to do business with another company. So if you haven’t taken measures to learn the art of trust-building, right now is the time. How? For starters, be transparent. Yes, there are trade secrets that have to remain hidden, and there are always circumstances where you can’t reveal every detail of your thought processes. But whenever possible, let your clients look behind the curtain. In your marketing, perhaps you can show your clients how your products are made (again, without revealing trade secrets.) Or, simply and honestly tell them why your offerings are better than that of the competition. Don’t lie or exaggerate, but instead present verifiable facts that demonstrate you are honest in your assessment of your own products. Another important ingredient to trust is sharing your business’s values with your clients and prospective clients. What types of things do really matter to you and your business venture? Is it innovation? Or helping other businesses succeed? Or maybe educating your clients about a confusing industry? Or even helping to change the world in some way? Wherever your passions lie, be open about them. Show your clients that you – the founder of this business – care about a cause that’s bigger than yourself or your profit margin. Being open, honest and transparent costs practically nothing. But it can skyrocket you into a competitive edge that few will be able to take away. Think you can jump into B2B entrepreneurship without legal help? Think again. It’s important – if not downright urgent – to work with a legal expert who knows every aspect of your business. Policies: You will most likely need website terms, a private policy, etc. Employment and Contractor Agreements: Do you know all the differences that exist between employees and contractors? Big consequences can occur if you don’t get this right, so obtain as much legal advice on this as possible. Intellectual Property Protection: Don’t be lax when it comes to registered trademarks. You’ll need to prevent others from using branding and language similar to yours. Legal Structure: Will you operate as a company, partnership, sole trader, trustee, etc.? Founder Agreements: Will you be going into business with other people? You’ll need advice regarding a partnerships agreement, shareholders agreement, or a unit holder’s agreement. While this list is certainly not an exhaustive one, it definitely contains some of the most important B2B entrepreneurial factors to consider. Any Other Advice for Those Who Want to Start a B2B Business? After reading these considerations, what is your gut telling you? 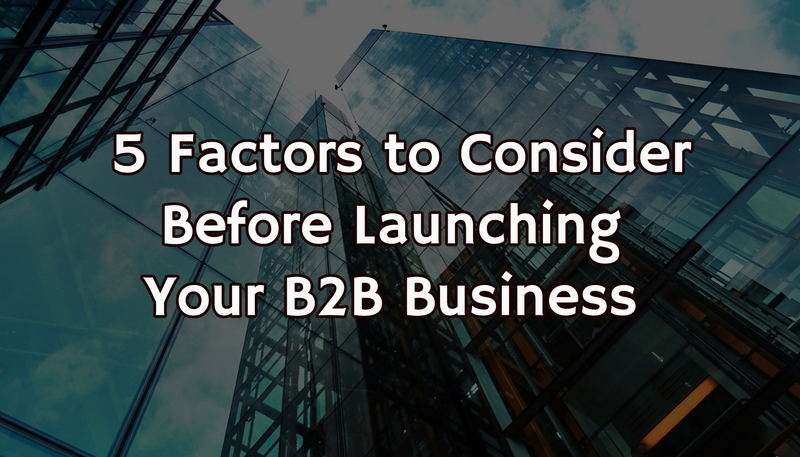 That this isn’t the time for launching a B2B business? That maybe it’s best for you to stick to your day job? If you are overwhelmed with intimidation, you might not be ready yet. But if your gut is telling you to go for it, this is a good sign that you might be up for the challenging lifestyle of a business founder. If you’re not intimidated by the factors above – and if you’re even inspired by them – this may be the time for you to get started.